breathtaking gold background with gorgeous blue and white flowers bursting forth. It is hand painted with a rich gold interior, and all the gold is in excellent condition. 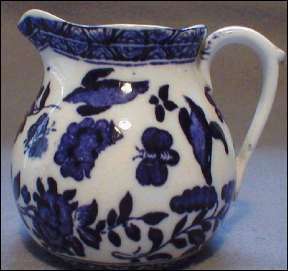 It dates from c:1891, and is marked on the bottom "England, Coalport". 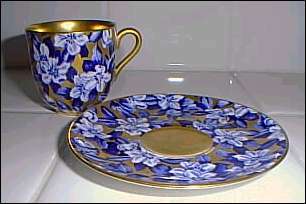 The cup measures 2" tall by 2 1/2" at its widest point, and the saucer measures 3/8" by 3 7/8" in diameter. This is "Mother Hubbard's Cottage". 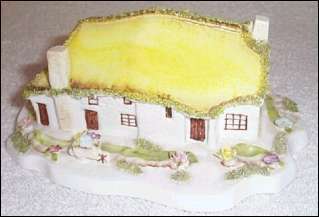 This little porcelain cottage measures 5 3/4" long by 4" wide. It is adorned with hand-applied flowers and spaghetti trim made to look like grass. 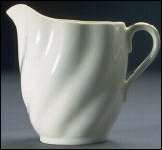 Coalport jug bearing the design mark Belfort. It carries a mark which would place from the late 19th century to early 20th century. 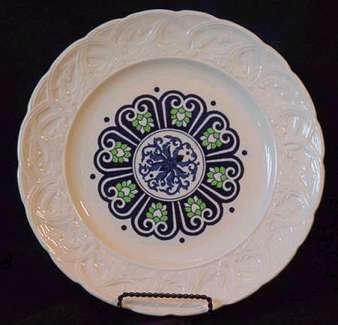 It carries a pretty blue and white design featuring birds, butterflies and flowers. It stands approx 2 3/4" high and 3 1/4" from spout to handle. 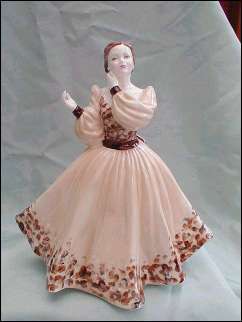 Coalport figurine CRYSTAL from the Ladies of Fashion series. This figure was discontinued in 1988. Approx 8" tall.